Archaeologists Rolfe Mandel, Mark Mitchell and Michele Koons inspect the excavation site Magic Mountain. In 1955, Disneyland opened in Anaheim, California. It wasn’t the first theme park, but it was the first connected to a movie studio; it was state of the art and it was a success. In 1957, a businessman and a sculptor tried to replicate it in Golden, a former mining camp and territorial capital at the base of the Front Range about 20 miles west of Denver. They hired a Los Angeles engineering firm led by a former Disneyland vice president and several Hollywood art directors and called it Magic Mountain. They planned an outer-space ride and it would feature the Western past they could imagine, of Victorian shops and cavalry stockades. By 1960, it was in foreclosure and then auctioned off, although the site kept the name. People had been digging around the environs of Magic Mountain for artifacts since the late 19th century. In the 1950s, Cynthia Irwin-Williams, a trailblazer for women in archaeology, went at it with her brother, and archaeologists returned to the site in the 1990s, finding radiocarbon-dated evidence such as arrowheads showing that early Native Americans had camped in the area as long as 5,000 years ago. On the other side of the world, it was the era of early writing and Egyptian dynasties. In the Rockies, it was the epoch of hunting super-bison and weaving other folkways. Last summer, several archaeologists dug farther at Magic Mountain. They knew it was propitious. 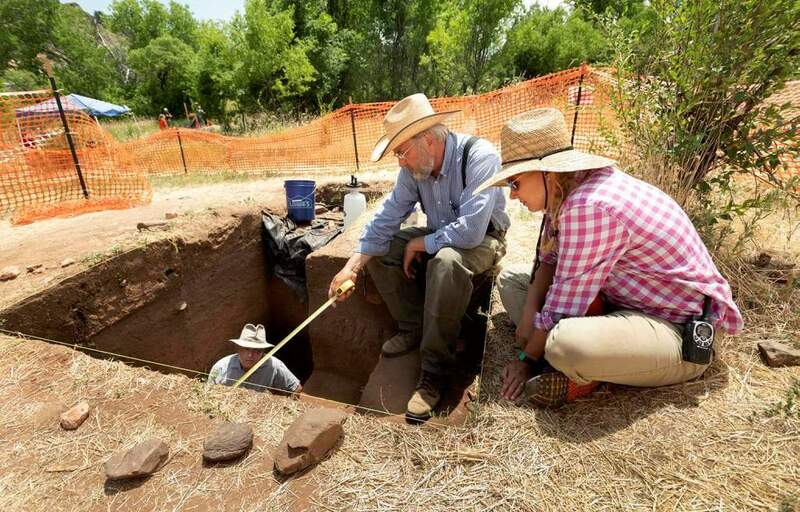 “It’s a great place to be in the winter,” Mark Mitchell with the Paleocultural research Group in Arvada told Mountain West News. He and Michele Koons, curator of archaeology at the Denver Museum of Nature and Science, along with Rolfe Mandel, executive director of the Odyssey Geoarchaeological Research Program at the Kansas Geological Survey, found animal bones last summer and stones chipped from humans making tools. They recently got radiocarbon results from the soil layer. It was 9,000 years old. We know that people first came to the Americas 15,000 years ago, perhaps even earlier, but so far little evidence of human occupation has been found for those first 7,000 or 8,000 years. We know they almost certainly hunted the now-extinct bison B. antiquus. About 30 percent larger than a modern bison, it was about 8 feet tall and 15 feet long, and nearly two tons. By 11,000 years ago, Paleo-Indians, the people who camped and lived at Magic Mountain had figured out how to take the huge bison down. They used atlatls – spear- or dart-throwers – about 3 feet long. To get a kill shot, they would have had to close within 20 yards of the beast. And it probably could have run 40 miles per hour – about twice as fast as a human could flee. For the first people to call the mountains home, it was worth the risk. Those bison could give them not just meat galore but bones for tools and hides for clothing. They were life. They must have spoken to the humans. Our past is the last undiscovered place.